How do you choose between spots as interesting as Washington D.C., and the country music mecca Nashville? 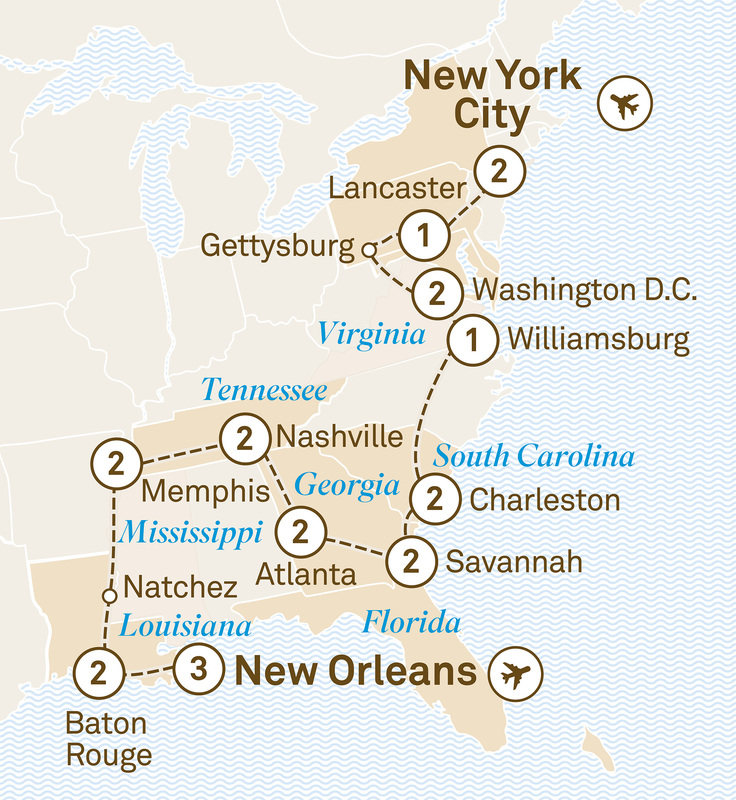 Or between New York City, ‘The Big Apple’, and New Orleans, site of the celebrated Mardi Gras? With this itinerary, you don’t have to. Enjoy the best of both worlds on a journey that will take you across a swathe of destinations that together define this great and inspiring country. Take a bite out of the Big Apple and discover New York City at your own pace on board a hop-on-hop-off double decker bus. View iconic sites such as Fifth Avenue, the Empire State Building, the Chrysler Building and the Statue of Liberty. Tonight, join your travelling companions over a welcome dinner. Today we visit an Amish farm for an insight into their culture, faith and way of life, which excludes modern conveniences such as electricity or telephones. This evening, enjoy a traditional family-style Amish feast. Overnight at the Inn at Leola Village. Day 4 - Lancaster > Washington D.C.
Take the historic trail to Gettysburg. Continue to Washington D.C., and settle into the luxurious Fairmont Washington D.C. for a two night stay. Today, delve into US history on a tour of Washington D.C., featuring the White House, Capitol Building and the Lincoln Memorial. The afternoon is yours to explore the city or the plethora of exceptional Smithsonian Museums. Continue your journey to Williamsburg, a city shaped by history. Tour Colonial Williamsburg, a living history museum, then enjoy a lively dinner. Overnight stay at the Williamsburg Lodge. Travel to South Carolina’s oldest and most charming city, Charleston. Spend two nights at the charming Renaissance Charleston Historic District Hotel. Explore Charleston on a tour through the quaint cobblestone streets. Choose from a diverse range of activities. Continue to the seaport town of Savannah. Learn the history on a hop-on-hop-off trolley tour. Enjoy a two night Special Stay at either the historic Mansion on Forsyth Park or The Bohemian Hotel Savannah Riverfront. Leave the small town charm of Savannah behind and head to the bustling metropolis that is Atlanta. Check into the Grand Hyatt for a two night stay. Visit the Atlanta History Center, which features a range of innovative exhibits on all things Atlanta. Continue to the home of Pulitzer Prize winner Margaret Mitchell, author of the classic civil war novel ‘Gone With the Wind’. The afternoon is yours to unwind. Discover Graceland, the famous home of Elvis Presley and enjoy a night out at BB King’s. Stay for two nights at the River Inn of Harbor Town. Visit the Civil Rights Museum on a self-guided tour. Enjoy the remainder of the day at leisure. Head to Baton Rouge today, stopping in at enchanting Natchez along the way. Two night Special Stay at Nottoway Plantation & Resort. Explore Louisiana’s bayous. Today, use the afternoon to further explore or simply relax. Tonight, select your dining venue of your choice. Choose how you want to spend your day with an activity of your choice. Enjoy a farewell evening of dinner and dancing to a local jazz band. It’s time to say goodbye at the end of a wonder-filled journey. Transfer to the airport for your onward flight.